How often do you hear a perfect work day described as ‘boring’ or ‘mundane’? On a truck roll testing the Peloton platooning system, that’s the exact definition of perfection. 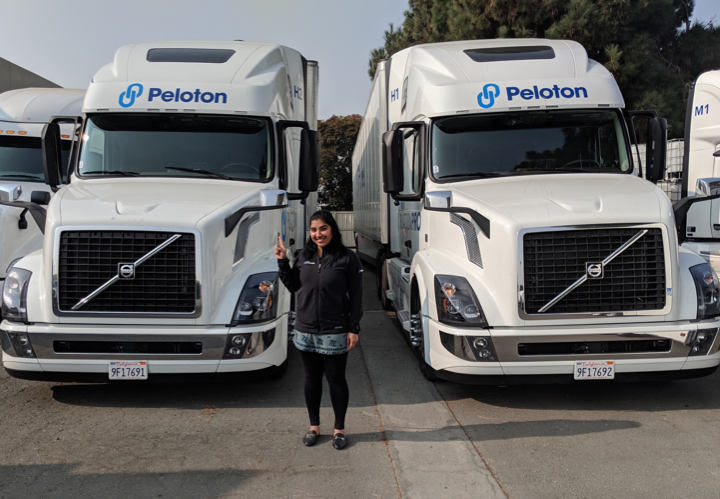 Peloton’s prime directive is safety, for platooning truck drivers and for everyone else sharing the roads with them. Ensuring safety means lots and lots of testing. What kinds of testing does Peloton do for its pioneering platooning technology? Let’s take the example of the release of a new version of the Peloton software. First, we go through a series of tests in a simulation. Next, we perform tests with the real hardware on the bench. These tests are linked back to our requirements as part of our ISO26262 process. Only once these all pass do we take this new software onto a track. The testing truck rolls begin on the test track, where we can safely verify the functionality that we have designed and implemented. The logistics include coordination of test drivers that have attained the needed Peloton certification to test the specific software functionality being tested. We use tracks in California, Texas, and sometimes tracks that our partners use in other areas of the country. For most of the safety testing, we use tracks that have large spaces to perform lane changes, hard braking, and other key maneuvers. We also use oval tracks, but those are mostly for fuel economy testing, where long durations of steady speed are needed. After the track testing is finished, Peloton test trucks move to the highways for additional levels of testing. The roads used for this testing are carefully mapped out and authorized for platooning by the Peloton Network Operations Cloud (NOC) and approved under state regulations. This next phase of testing is used to introduce the updated feature to a real-road driving environment. A safe platooning distance is always maintained, and experienced drivers conduct these tests along with the observing engineers, who monitor the system and its updates. While test observers are often in the trucks, they do have the ability to be remote. Remote observers are only used once a route and software have been tested. Once an appropriate number of platooning miles is reached, this software version is deemed to be stable and ready for general road use by Peloton’s trained drivers. For the commercial system, the final phase of the testing is mileage accumulation, where we drive sufficient miles on the highway to validate that the hardware and software meet reliability targets. If you’d like to learn more specifically about our approach to safety, check out our safety report here. 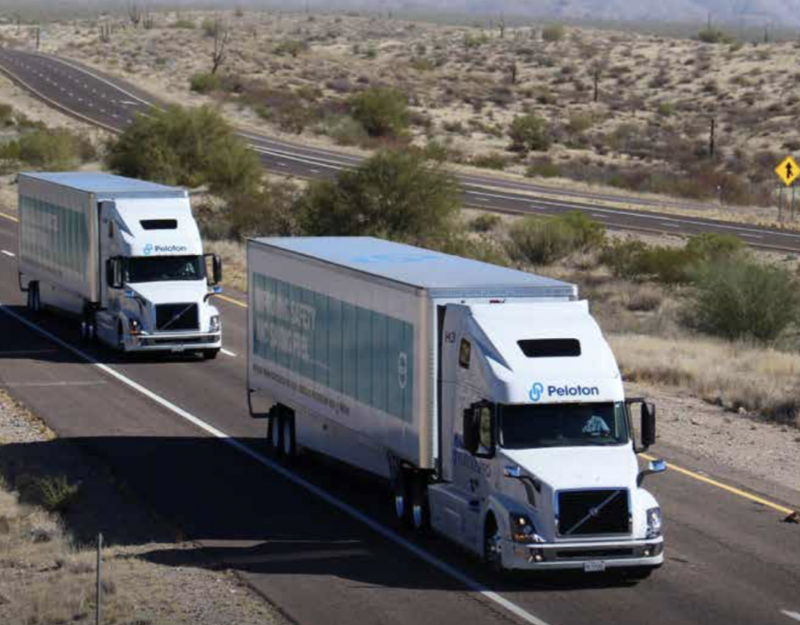 The Peloton test truck fleet includes both day cabs and sleeper cabs. The day cabs accommodate two people: the driver and an observer. In the sleeper cabs, Peloton has replaced the resting bed that is normally in the rear of the cab with three additional air suspension bucket seats to increase the capacity of a sleeper to five. This way, you can have up to ten people platooning in the lead and follow trucks at a single time. In the day cabs, the truck roll participants are the professional driver and a Peloton engineer who acts as an observer/reporter. The sleeper cabs can accommodate a bigger party, with the driver and up to four observers. 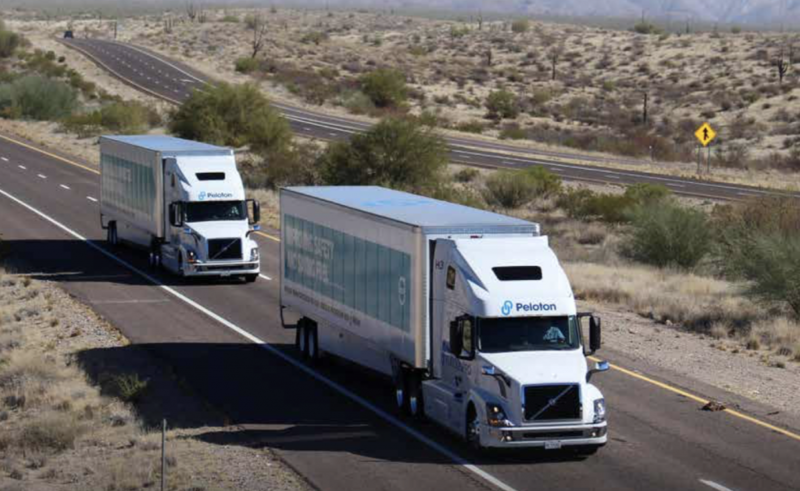 Often, the ‘extra’ observers are Peloton engineers interested in monitoring the performance of their own system feature, or other Peloton employees—every employee is encouraged to experience platooning in truck rolls and see their hard work in action. We also utilize the sleeper cabs for demonstrations of platooning to potential customers, investors, media, or regulators who want to experience platooning. When given a choice between the lead and the follow truck, most observers prefer to be in the follow truck. That’s where the real magic of platooning happens. It’s where you get the full impact of what it feels like to travel the roads in a huge truck—so high off the ground it’s like sitting in an airplane that’s running on an airstrip—that’s being controlled by another huge truck, just ahead of you on the highway. And that’s where the appreciation of ‘boring’ and ‘mundane’ kicks in. Uneventful trips, where all you do is watch the road and dirt and rocks outside the window, mean that everything is working as it’s designed to work. And that means safe platooning for all.